Welcome to flautist, composer/arranger, pianist and teacher Gareth Lockrane's website! Enjoy the videos and sounds on this site, hope to hear from you! MY BIG BAND ALBUM IS OUT ON WHIRLWIND RECORDINGS! COME TO THE ALBUM RELEASE GIG AT THE BEAUTIFUL CONCERT HALL AT KINGS PLACE, LONDON! 11TH SEPTEMBER 2017. 730PM. SINCERE THANKS TO EVERYONE WHO ORDERED ADVANCE CDS OF THE BIG BAND RECORD! April 2016 - Flautist Xavier Querou's done a notated video transcription of a live solo of mine, give it a listen/look! MY FIRST TWO ALBUMS "PUT THE CAT OUT" (2003) AND "NO MESSIN" (2010) ARE AVAILABLE TO DOWNLOAD FROM ITUNES - click on the titles to purchase. INFO AND REVIEWS ABOUT "THE STRUT"
CLICK ON THE PICTURE BELOW OR HERE TO LINK TO WHIRLWIND RECORDINGS TO BUY CDS/DOWNLOAD MP3S AND TO HEAR SOME CLIPS FROM THE NEW ALBUM..
4 star review for "The Strut" in Mojo magazine! 4 STARS IN JAZZWISE NOV 2012 ISSUE - HERE'S THE REVIEW! Gareth Lockrane is the UK’s premier jazz flautist, a prolific and versatile musician who makes regular sideman appearances as well as leading his own small groups plus his acclaimed contemporary big band. I’ve seen Lockrane play live with the Bannau Trio (with vocalist Nia Lynn and pianist Ross Stanley) and as part of guitarist Phil Robson’s Immeasurable Code group and have been hugely impressed by his contributions to these two very different bands. I also reviewed his 2010 septet release “No Messin’”, a punchy and hugely enjoyable album which has more than a little in common with the hard hitting, yet surprisingly subtle,sound of Lockrane’s Grooveyard band. It’s been nearly ten years since the release of the last Grooveyard album “Put The Cat Out” (2003) and although the band has remained active a fresh recording has been long overdue. It’s perhaps a tribute to the exceptionally busy members of the quintet that it’s taken so long. Lockrane (flutes), Alex Garnett (reeds), Mike Outram (guitar), Ross Stanley (organ) and Nick Smalley (drums) are all phenomenally in demand musicians with flourishing jazz careers. For this recording the core group is augmented by guest vocalist Nia Lynn on three of the album’s eight tracks. As the band name suggests Grooveyard’s music is swinging and unpretentious with its roots in Blue Note era hard bop, soul jazz and funk (a fact emphasised by the distinctive cover art) but nonetheless offers a wide ranging and sophisticated compositional palette that reflects Lockrane’s work as a film and television composer. His range of flutes including the alto and bass varieties plus Garnett’s playing on tenor, soprano and baritone saxes in addition to bass clarinet offers considerable scope and the range of colours and textures the core quintet realise is impressive. Opener “Frizz” is a case in point, a slow burner introduced by solo flute and featuring gospel organ, relaxed drum grooves and the richly textured playing of Lockrane and Garnett on a variety of reeds. Garnett and Stanley deliver relaxed but muscular solos and although the jam band atmosphere is in evidence there’s an engaging element of sophistication too. “Whistleblower” is richly textured and highly melodic with bright and inventive rhythms courtesy of Smalley. Garnett solos fluently above the swell of Stanley’s Hammond and the patter of Smalley’s drums. Lockrane himself features prominently, agile and airy on flute. Stanley’s Hammond is at the heart of the band with Lockrane deliberately focussing his writing upon the keyboard and the organist excels again here. Nia Lynn’s wordless vocals add additional colour and there’s also a drum feature for the consistently excellent Smalley. Guitarist Outram, sparsely represented thus far also comes into his own on this uplifting item inspired by Roland Kirk. Lockrane used to work extensively with the talented but troubled South African pianist and composer Bheki Mseleku (1955-2008). As well as playing in Mseleku’s band Lockrane also used to transcribe his melodies, although a brilliant composer of tunes Mseleku lacked formal music reading skills. “One For Bheki” is a moving tribute to his former colleague, a delicate lament featuring a lush blend of horns together with gently soulful Hammond. Lockrane’s range of flutes add a tantalising South African feel to the music that also makes it strangely uplifting, a celebration as well as a lament. Outram weighs in with a coolly elegant solo that demonstrates his taste and versatility. Lynn’s wordless vocal adds an ethereal note to the arrangement. The pieces are no less enjoyable in a small group context with the fearsomely funky title track fuelled by a great groove courtesy of Smalley, Outram and Stanley. Lockrane’s bright and airy flute contrasts well with Garnett’s earthy tenor sax and Outram also gets to strut his stuff with a powerful, rock influenced solo. “Lock Out!” is soulful rather than out and out funky with its relaxed grooves framing solos from Lockrane on frothy flute, Stanley on blues drenched Hammond, Garnett on typically forthright tenor and Outram, coolly nimble on guitar. The title of “Memories In Widescreen” is presumably a reference to Lockrane’s early love of cinema and subsequent work as a film composer. There’s certainly a cinematic lushness about the arrangement on one of the album’s most reflective pieces. Lynn’s wordless voice adds to the rich textures provided by flute and organ. Stanley’s quietly exploratory Hammond solo is a particular highlight with Lockrane on flute and Outram on coolly spacey guitar also impressing. “Method In The Madness” is denser and more urgent with effervescent solos from Lockrane, Garnett and Outram plus a scintillating drum feature for the dynamic Smalley, an intelligent and imaginative presence throughout the album. At first sight the closer “Come On” appears to be an unpretentious Hammond fuelled soul jazz/funk work out, but as ever Lockrane’s writing and arranging offers subtler twists too. The solos are certainly powerful statements, Outram on urgent blues/rock guitar, Garnett on muscular, gutsy tenor and the leader eloquent on flute. Lockrane brings a lot of himself to Grooveyard and his imaginative writing and arranging plus the superb playing skills of himself and his band-mates ensures that “The Strut” transcends the sum of its obvious influences to create something much more original, distinctive and personal. I’m told that Grooveyard also played a hugely successful London Jazz Festival set at The Forge in Camden. ...Whirlwind is also home to flautist Gareth Lockrane's mighty Grooveyard, whose 'The Strut' serves up first-rate, finger-snappin' soul-jazz of considerable imagination. Many saxophonists double on flute but very few — such as Hubert Laws, Herbie Mann and Jeremy Steig — have majored on it. Britain’s top exponent is Gareth Lockrane, whose hip ideas and easy fluency recall the great Tubby Hayes. He sparkles here in an all-star quintet featuring tenorist Alex Garnett and guitarist Mike Outram, with versatile Ross Stanley swapping piano for hot Hammond organ. Lockrane’s stylish originals include the funky title track and the gentler One for Bheki, dedicated to a departed friend, South African pianist-composer Bheki Mseleku. The flute used to have a rather wussy reputation. In jazz Herbie Mann changed all that, especially with his Memphis Underground album which placed the instrument in a rock context. Gareth Lockrane achieves a similar thing by using his various flutes at the heart of a band full of muscle and edge. He has Alex Garnett on saxophones, Mike Outram on guitar, Ross Stanley on Hammond and Nick Smalley on drums, with Nia Lynn adding wordless vocals on a trio of tracks. The arrangements are modern and not restricted to the heads, working the tasty timbral blend of flute, saxophone and guitar in throughout. After a couple of grooving openers which set up the scenario, Lockrane layers his array of flutes and the saxophones for a gently lyrical opening to a remembrance piece for the late, great South African pianist Bheki Mseleku. It’s a real peach. The title track deserves its own jazz dance – maybe we’ll see one at the launch party at The Forge in Camden, London on Friday! Solo honours must clearly go to the leader but Garnett also pumps out a few real barnstormers, and Outram is often only a few bars from head-back, gurning rock guitar wild man. Stanley and Smalley dig deep, too. In fact, it really is a proper band album rather than a collection of individuals. So, a fine disc which is not only a testament to the writing and arranging of a well-rounded British jazz musician and a great band, but also a renewed hurrah for the versatility and power of that little silver sideways pipe. 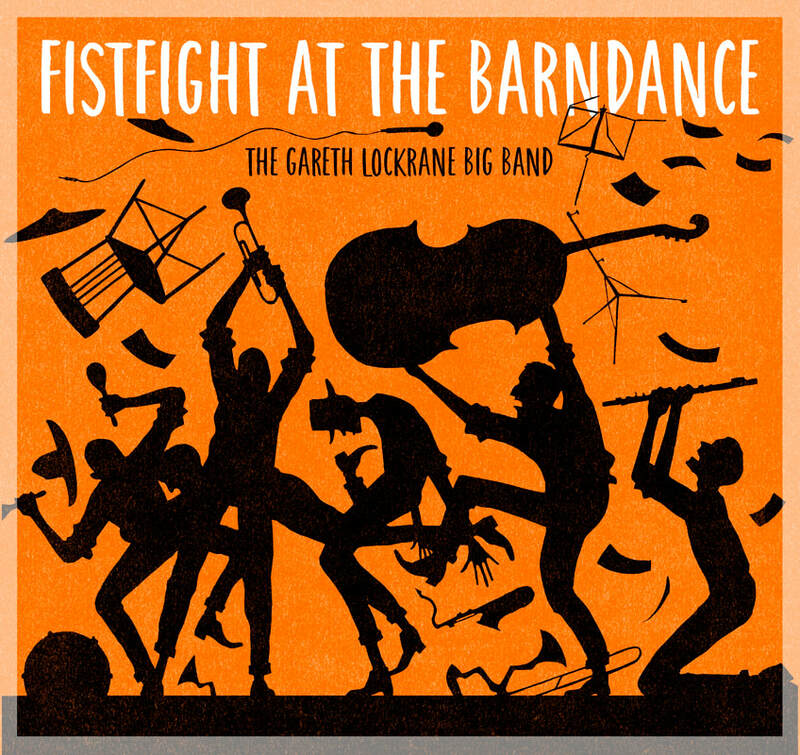 Given that he has a masters degree from the National Film and Television School, it is perhaps unsurprising that a lot of flautist Gareth Lockrane’s compositions sound evocative and dramatic enough to be film scores, even when – as here – he is providing relatively straightforward ‘soul jazz’ for his aptly named Grooveyard band, completed by Alex Garnett (saxophones, bass clarinet), guitarist Mike Outram, organist Ross Stanley and drummer Nick Smalley. Funk – even light, soulful funk such as this – is perhaps not readily associated with Lockrane’s instrument, but anyone who’s seen him live (for example with Phil Robson’s ‘Immeasurable Code’ band, where Lockrane held his own with both Robson and US saxophonist Mark Turner) will know just how robust, gutsy and compelling his soloing can be, and here, he draws the ear every time he picks up any of his three flutes. The versatile Garnett and the consistently imaginative, fluent Outram are also impressive throughout, and with Nia Lynn guesting on three tracks with her atmospheric wordless vocals this is a lively, unpretentious album that promises much from the band’s live act. Full marks for the album title, a neat turn of phrase, and praise too for the illustrations by one Bill Bragg with lively design from Matt Willey contributing to a strong look featuring cat-like freaky creatures in overcoats carrying musical instruments against a great dollop of red, the figures zigzagging from as far as the eye can see to up close at the front, matched with a litter of well chosen fonts. Highly rated flautist Lockrane has written all but one of the tunes that very often rely on the Lonnie Smith-like organ of Ross Stanley. Vocals later by Nia Lynn retain the outlook of a band that won’t be hurried, and it’s a set for connoisseurs of the soul-jazz sound from the 1960s played by some of the busiest straightahead players around. Old school for sure, The Strut is a highly likeable release that values musicianship and strong tunes played with a respect and the right attitude adhering to the best traditions of jazz from the Golden Age.